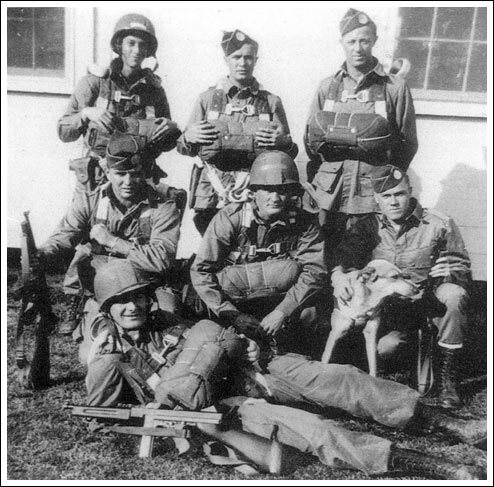 Seven paratroopers of the 507th Parachute Infantry Regiment pose with the regimental mascot "Geronimo" prior to a paratroop training exercise in 1943. Few men in the 507th PIR made it through the Normandy campaign unscathed, as represented by the fate of the paratroopers in this photo: Sgt. John Carson Smith (standing, at left), wounded in action; Pvt. William H. Witt, killed in action; Pvt. Lewis S. Toye, killed in action; Cpl. Walter L. Choquette (kneeling, at left), executed at Graignes; Pfc. John D. Williams, injured in training; Pvt. William McDade, wounded in action; Pvt. Bernard E. Kelly (front) taken prisoner of war. Smith, who appears in D-Day: Down to Earth, passed away in October, 2003.